Clean Carfax with Heated Leather, Backup Camera and Bluetooth. The 2017 Infiniti QX50 ranks near the top of its class thanks to its robust engine power, thrilling handling, and low overall ownership costs. The 2017 QX50 is a good SUV and a good buying decision. It has great overall performance, driven by a muscular V6 engine and engaging driving dynamics. Its safety and predicted reliability ratings are on par for the class, but this Infiniti really sticks out for its value. It has low average prices and should cost you less to own than many more luxurious class rivals. Prices for the 2017 QX50 range from about $25,000 to about $34,900, with the average price landing around $29,800. This data comes from more than 400 listings for the 2017 QX50 on our site. Exact prices fluctuate depending on the vehicle's features, mileage, condition, and location. The 2017 QX50 is part of a generation that began in 2008 as the Infiniti EX35. There were no major changes from 2016 to 2017, so you can likely save some cash and get an identical vehicle by shopping for a 2016 model. However, there were some key updates made for 2016 that make it a better choice than older models (though a 2014 or 2015 QX50 could probably save you even more money). Infiniti stretched the QX50's wheelbase and overall length, and nearly all that extra space ended up in the back seat. Occupants enjoy 6.3 more inches of rear legroom and 3.9 more inches of knee room. Heated front seats and a moonroof were also added to the list of standard features for 2016. The 2017 QX50 is part of a generation that began in 2008 as the Infiniti EX35. There were no major changes from 2016 to 2017, so you can likely save some cash and get an identical vehicle by shopping for a 2016 model. However, there were some key updates made for 2016 that make it a better choice than older models (though a 2014 or 2015 QX50 could probably save you even more money). Infiniti stretched the QX50's wheelbase and overall length, and nearly all that extra space ended up in the back seat. Occupants enjoy 6.3 more inches of rear legroom and 3.9 more inches of knee room. Heated front seats and a moonroof were also added to the list of standard features for 2016. The 2017 QX50 is only available in one trim level, and all available features are grouped into packages. A 3.7-liter V6 engine and a seven-speed automatic transmission are standard, with either rear-wheel drive or all-wheel drive available. The QX50 comes with a nice array of standard features, like leather and heated front seats, a moonroof, satellite radio, and an infotainment system. You'll find a Bose sound system in models with the Premium package, while the Premium Plus package includes things like navigation, parking sensors, and a surround-view camera (these models will also come with the contents of the Premium package). Most drivers should seek out a model with the Technology package, which comprises most of the available driver assistance and advanced safety tech. These features are adaptive cruise control, forward collision warning, automatic emergency braking, lane departure warning, lane keep assist, and blind spot monitoring. The 2017 QX50 was only sparingly crash tested. It received four out of five stars in the National Highway Traffic Safety Administration's rollover test. The Insurance Institute for Highway Safety rated the QX50 Good (the highest rating) in the three tests that it performed. A rearview camera is the only driver assistance feature that comes standard in the 2017 QX50. 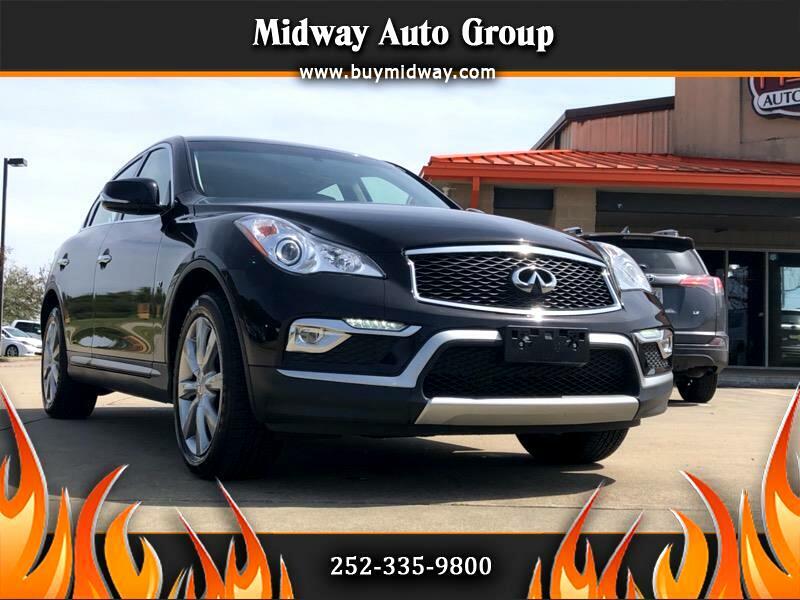 Available advanced safety features include adaptive headlights, front and rear parking sensors, a 360-degree surround-view monitor, adaptive cruise control, forward collision warning, automatic emergency braking, lane departure warning, lane keeping assist, and blind spot monitoring. These features are available in many SUVs in the class, and some models even include them as standard equipment.